French Fridays on Watch the Titles features the opening credits for Roman Polanski's first color feature, designed by one of the most important French creators of the last decades, André François. François was one of the first title designers who played with the logo of a major studio. In the lovely hand-drawn opening credits for The Fearless Vampire Killers, MGM's famous lion is replaced by a cartoony vampire. The drop of blood that trickles down from its fang connects all the elements in the sequence. After years of searching for vampires, Professor Abronsius and his young disciple Alfred set up in a Transylvanian inn. As many clues indicate that vampires really do exist – the two men quickly find that their suspicions are true. 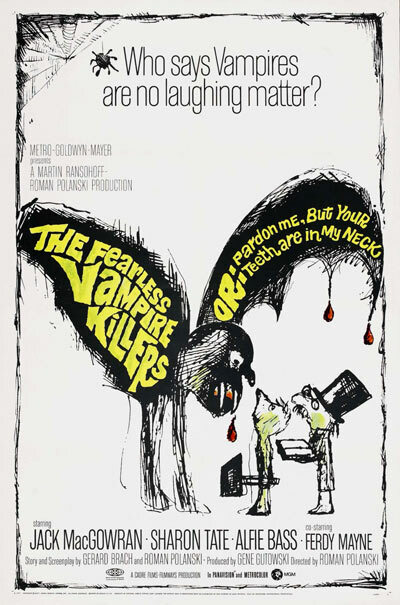 The Fearless Vampire Killers is the second out of three fantastic comedies by Roman Polanski. The trilogy begins with Repulsion in 1964, and ends with Rosemary’s Baby” in 1968. Half-French and half-Polish, Roman Polanski is a movie director, an actor, a producer, a scriptwriter and a theater and opera director. Maybe due to his broad experience, he compares movie titles to an opera opening. Polanski always asked his producers to invest in a substantial title sequence. From his point of view, the main title – a legal obligation – slowly leads the audience into the universe of his creation. He considers it as a part of the movie as a whole. That’s why he preferred to work with accomplished designers such as Maurice Binder, Jan Lenica and Wayne Fitzgerald to create titles for him. For this movie he called upon the talents of the famous graphic designer, illustrator, painter, sculptor and set designer, André François. This title sequence begins in a wonderfully funny and unexpected way, with the MGM's lion turning into a vampire. The tone is set – we are watching a comedy. But playing with a major studio's logo was considered very unusual at the time. For some movie directors it was a way to show their independence from the studios they worked with and to establish themselves as authors. Though the goal here was mainly to have fun. Polanski had a hard time persuading his producers about spoofing the MGM logo. Producer Martin Ransohoff didn’t like Polanski's unconventional way of directing the movie. Two versions of the movie were made – an American version, stripped bare of Polanski humor and a European version to which Polanski kept the rights. André François makes an amazingly fluid transition between the logo, the titles and the movie. A drop of blood is used to link all the elements of the title sequence. It drips down from the vampire’s fang and jumps from word to word. The blue background constitutes the second element in the transition. The wonderful landscape at the end of the sequence, when the movie starts are matte paintings made by Doug Ferris and Peter Melrose. It's worth mentioning that this is Polanski’s first color feature and he makes the most of this experience. The title sequence uses contrasting, bright colors, like the movie. André François painted the credits himself. They subtly reference horror movie titles. He animated the drop of blood to create a humoristic effect and to announce the cartoon spirit of many of the scenes. An additional anecdote sets the mood – one of the technicians is credited for the fangs. His name is “Dr Ludwig von Krankheit,” which is German for “illness.” The entire credit sequence galvanizes the atmosphere. After many collaborations with Polanski, Komeda's score for The Fearless Vampire Slayers is one of his best. He composes his music with bewitching choirs which evoke horror, but the singing makes us travel between death and laughter. André François is one of the most important French creators of the last decades. Born in Hungary in 1915, François attended the Hungarian Academy of Fine Arts in Budapest. He moves to France in 1934 and adopts the French nationality in 1939. There he takes lessons with the influential Ukrainian-French A.M. Cassandre. He works in France, the USA, Switzerland and the UK. François' work shows his amazing sense of humor. He has always used his creations to criticize the world he lives in, but always in a gentle way and never without wit. This title is made similarly. It begins in a wonderfully funny and unexpected way, with the MGM's lion turning into a vampire. The tone is set – we are watching a comedy. a briliant find! thanks a lot! Thanks. Glad you like it too!